Mercury's apparent size is only 1/157 that of the Sun. Otherwise said, if one would have a projected solar image of 157 mm, Mercury would appear as a small ink-black dot just 1 mm in size. Despite this tiny size, it will stand out from any other sunspots which are more grayish and irregular in shape. Mercury will transit the solar disk in 7 hours and a half. The transit will be visible, entirely or in part, from most places on Earth except for eastern Asia, Japan, Indonesia, Australia and New Zealand. Barring cloudy circumstances, Belgium will be able to enjoy the transit in its entirety. In Uccle, the first (external) contact between Mercury's disk and the solar limb will be at 13:12:19 Local Time. At 13:15:30LT, Mercury's disk will have become entirely visible (internal or "second" contact). At 16:56:13LT, the separation between the respective disk centres will be smallest (321 arc seconds or a bit less than 1/6 of the solar diameter). At 20:37:21LT, Mercury's disk will start leaving the solar disk (internal "third" contact), and at 20:40:33LT the transit will be completely over (external last contact). At that time, the Sun will be barely 4 degrees abov the horizon. 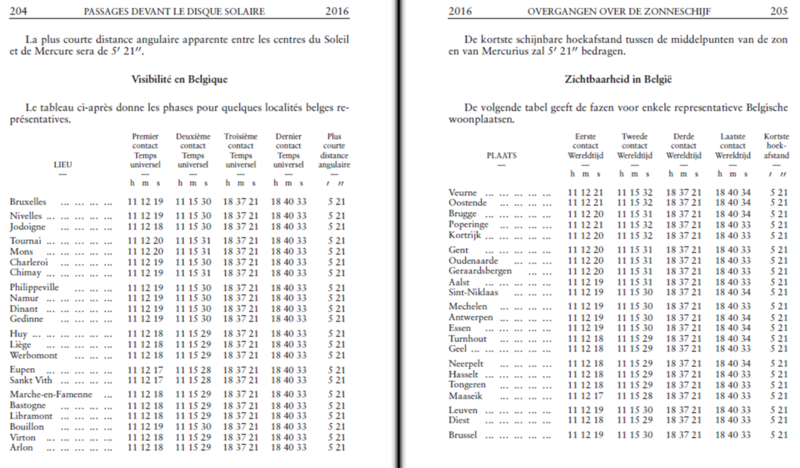 For other places in Belgium, the aforementioned timings will at most differ by 3 seconds. More info can be found in the ROB Year Book 2016 , p 201-205.